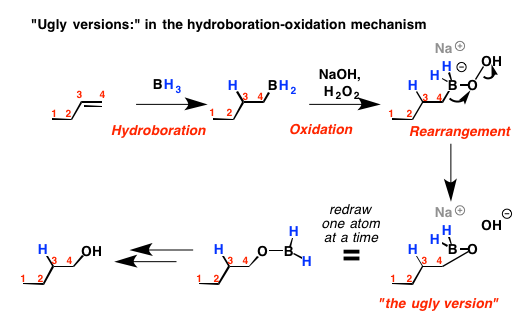 When figuring out what the product of a reaction is, there are really two important steps. 1. Figuring out where the electrons go. I’d say at least 70-80% of the difficulty students have in organic chemistry mechanisms comes from part 1. Part 2 is about 20-30%. This is a minor tragedy, by the way. It should be closer to 98/2, not 70/30. I see a lot of smart students mess up step 2, even when they draw the right arrows. Once you have the arrows drawn right, there is really no reason why you should not end up drawing the product correctly. Figuring out where the electrons go is the *hard part*! That’s the part that takes thought. Drawing the product afterwards is almost purely mechanical. It should be as boring and repeatable as a conversion after a touchdown. Fortunately these errors are completely preventable. The first important thing to make sure you do is to number your carbons. This alone will help you prevent a lot of commonplace errors. The second most important thing is a bit more subtle. It’s common to want to draw a product that looks pretty, because that’s how it’s drawn in the textbook. There are also worries, especially on exams, that you’ll have grades deducted if you draw something that looks gawd-awful. I say screw it. Draw the ugly version first. Get the connectivity right. THEN draw the pretty version. Draw in the curved arrows (making sure the carbons are numbered). Now, using the arrow formalism rules, form and break all the bonds the arrows tell you to – without moving any atoms around. 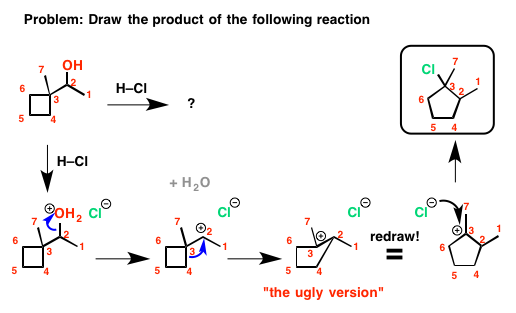 THEN, once you have the ugly version, take your time to redraw the molecule carefully – one atom at a time. Here’s 3 examples of what I mean. 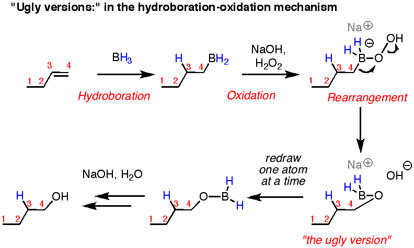 The tricky step in the hydroboration mechanism is showing the formation of the carbon-oxygen bond. 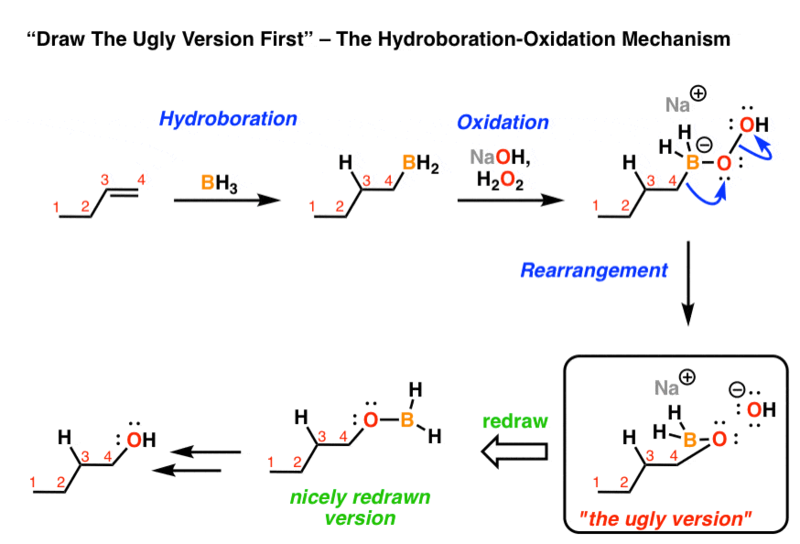 Even when people get this right, I’ve seen them do crazy things like re-draw the carbon still attached to the boron. No no no. If you just do everything the arrows tell you to do, draw it ugly, THEN redraw, you will be just fine. 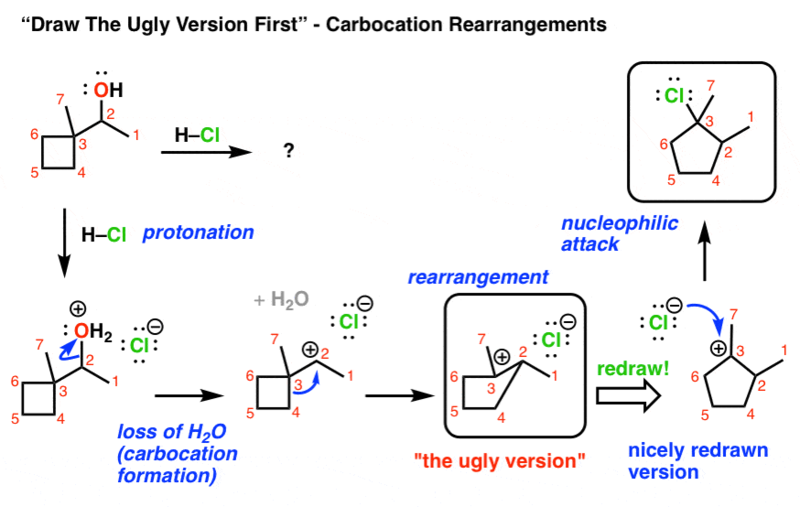 Another example which trips people up is in doing rearrangements of carbocations. It’s a lot harder to mess things up if you number your carbons, and redraw your first example EXACTLY as before, only breaking/forming the bonds the arrows tell you to. Afterwards, go one carbon at a time and redraw it into something nice you can be proud of. I could really go on and on about different examples where this comes into play, but this example should be sufficient. 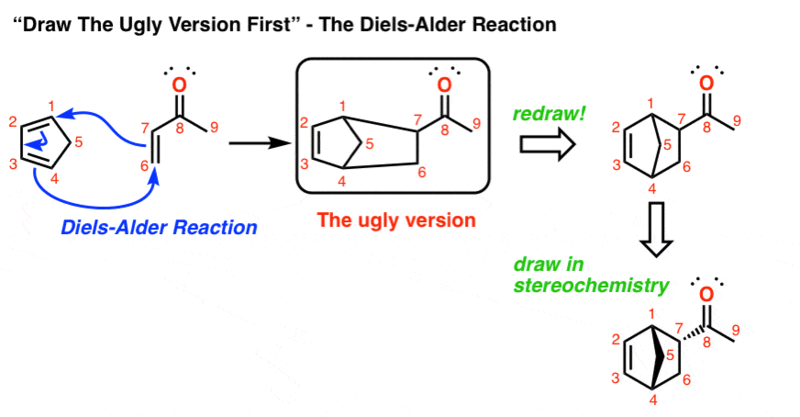 A third case where this comes up is in the Diels Alder. For some reason drawing something where there is a ring in the diene component always seems to mess people up. The thing I feel compelled to point out is that you don’t actually need to understand these reactions to draw the products correctly. Once the arrows are drawn in, that’s it. By following the arrow pushing rules, you don’t actually need to think. It’s completely mechanical. A robot (or an iPhone app, hmm) could do it. So when you’re going from “arrow pushing” to drawing the product, don’t worry so much about making it look pretty. Draw the ugly version first. You can always clean it up later. Couldn’t agree more about drawing the “ugly” products first! You’d be surprised how much computer technology actually facilitates this practice (due largely to copy and paste, in my experience). Students stop sweating the small stuff when copy/paste is available. b flip side is that students get lazy justifying their arrows in the first place and tend to try to brute force their way to products. Fixed! Thanks for the suggestion.